When looking at the essential items for starting and growing a small business, there are a lot of factors to consider. Everything from setting your growth plan in motion, to choosing effective graphic design to ensuring that your customer experience is as positive as possible. But one factor that goes often goes by the wayside is privacy. Perhaps because it seems like less of a big deal with smaller businesses. If the amount of clientele is limited, the business won’t seem like such a big target. So the privacy and security measures in place aren’t as stringent as they could be. But thinking like this is not only potentially harmful to your clients, it’s also detrimental to your brand and its growth and stability. All businesses face some common enemies, according to the site IT Business Edge, which noted that “data breaches, cloud computing, location-based services, and regulatory changes” all regularly force companies to reassess their privacy policies that are in place. Though it’s more noticeable with big names, such as the security breach at Target which affected forty one million consumers in 2013 (and which forced the big name store to shell out eighteen and a half million dollars as damages), small stores are not automatically exempt simply because they have fewer customers. Because of this, security measures are vital, no matter the size of the concern. The good thing is, if a small business sticks with best practices when it comes to their security, it can be a boost to their relationship with their customers. If you had a choice between patronizing two shops which offered similar wares, and you knew that one guaranteed their items and the other didn’t, which one would you choose to shop at? Think of “privacy” as an item that your business should offer to its customers. Choosing best practice privacy policies and making your choice known to your clientele helps to build their confidence in your brand. When they see that their privacy is a priority to your company, it strengthens their desire not only to be a customer, but to return again after the initial visit or purchase. 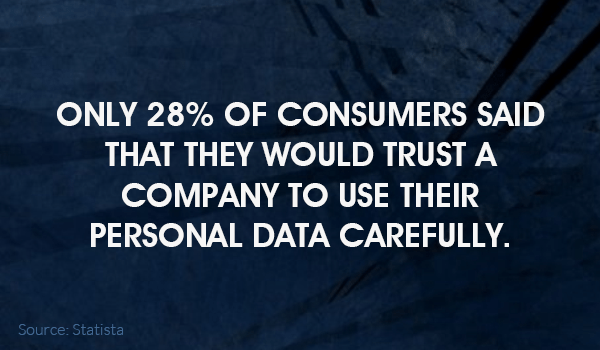 In a poll of internet users, only 28 percent said that they would trust a company to use their personal data carefully. With online companies growing by the month, the confidence of their customers seem to be shrinking. Strategically choosing and implementing your privacy policies can give your brand a solid base on which to build. Privacy policies can also help to protect your brand. A brand is more than just a logo or a company name. A brand is about the entirety of the customer experience, from start to finish, and beyond. So if you’re seeking to build your brand using some online tools, and protect it from a tarnished reputation, it’s important to keep on the cutting edge of privacy as well as other aspects of customer service. Protecting your customers protects your brand. As with the incident of the security breach at Target mentioned earlier, as well as countless others in recent years, lack of privacy does damage to a brand. Not just in the amount of money needed to pay damages, but in the reputation of the brand with both existing customers and potential new clients. The privacy measures put into place depend greatly on the type of small business you own. With an ever-expanding uptick in virtual stores and services, online security concerns are generally the more pressing need. At any point within the customer’s journey from visitor to consumer, there is the potential for a security breach. So your service portal, app, or website as a whole must be protected throughout, not just when it comes to payment details. Though credit card information and the like are typically thought to be of the greatest concern, protection of a client’s personal data in any form — name, demographic, address — should be equally as important to a company dedicated to best practices. And it isn’t just online, either. If there is any in person contact, such as through a brick and mortar store, a booth, or even mailers, the same privacy policies should be in effect. Privacy needs to be cohesive and set standards across the board in order to be effective and build your brand. Next post: How to reduce your load time for 1 second in 5 Minutes?